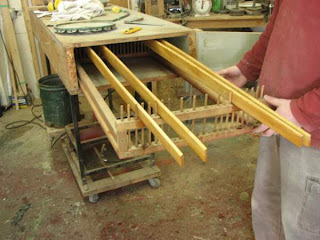 Now that all that old resin is off of the Bob's Special, it is time to get the new ribs bent. I'm nearing the end of my current White Cedar stock, I have stock left for narrow ribs and have some planking milled, but not much left that is suitable for 2 1/4" wide 65" long ribs. So I have to be careful with these ones! Into the steambox they go. After about 20 minutes of generous steaming they are ready to bend around the canoe to take the correct shape. 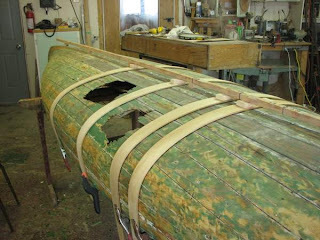 They get bent at a section of the canoe that is just slightly smaller than where they will be installed to ensure a proper fit. After they cool, the old broken ribs are removed and the new ones put in their place. At this point they are just clamped in place. 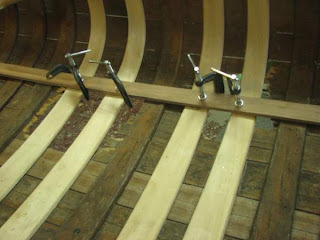 There is a lot of open space here where the planking is busted out, so a batten is clamped to cover a number of ribs to keep them all lined up. 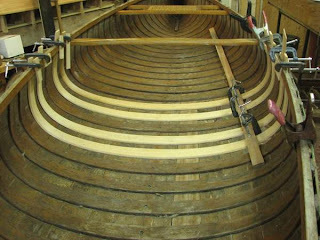 Now I have two broken ribs to repair, the ribs to fasten with canoe tacks, and all that busted out planking to replace.